Calling all frill-seekers! Ruffles are a massive swimwear trend at the moment and it�s easy to see why. Fabulously feminine, a gentle frill is super flattering on bikini bottoms because it doesn�t cling - it just skims over your body. 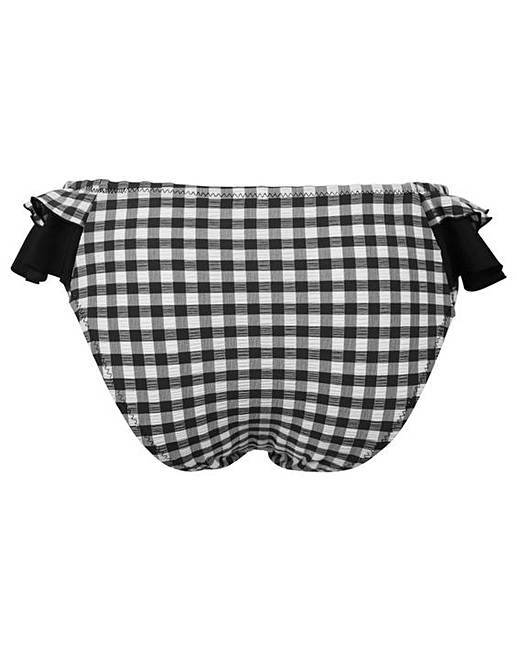 Perfect if you�re pear-shaped, the clever black ruffle design instantly slims hips, meaning the Checkers frill brief are certainly cut to flatter. But we�ve ramped up that graceful, romantic vibe even more with a cute gingham print that keeps the look fun and flirty. Wear them to the beach matched with a floppy straw hat and oversized shades and you�ll show off your playful side faster than you can say, �let�s build a sandcastle!"